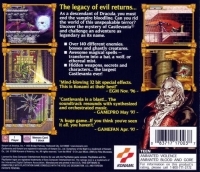 Box Text: The legacy of evil returns... As a descendant of Dracula, you must end the vampire bloodline. Can you rid the world of this unspeakable terror? Uncover the mystery of Castlevania and challenge an adventure as legendary as it's name. Over 140 different enemies, bosses and ghastly creatures. Awesome magical spells - transform into a bat, a wolf, or ethereal mist. Hidden weapons, secrets and characters... the largest Castlevania ever! 09-20-2011 scott Box Text The legacy of evil returns... As a descendant of Dracula, you must end the vampire bloodline. Can you rid the world of this unspeakable terror? Uncover the mystery of Castlevania and challenge an adventure as legendary as it's name. Over 140 different enemies, bosses and ghastly creatures. Awesome magical spells - transform into a bat, a wolf, or ethereal mist. Hidden weapons, secrets and characters... the largest Castlevania ever! 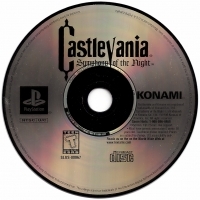 This is a list of VGCollect users who have Castlevania: Symphony of the Night - Greatest Hits in their Collection. This is a list of VGCollect users who have Castlevania: Symphony of the Night - Greatest Hits in their Sell List. 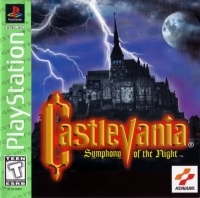 This is a list of VGCollect users who have Castlevania: Symphony of the Night - Greatest Hits in their Wish List.